BJ CK7525 CNC eszterga - CNC gép, kábelvédő, fúrótömlő; Kutenich Kft. The CK series of CNC lathes feature a strong cast base and an exclusive slant bed structure which provide excellent rigidity, dampening and convenient chip removal. The high precision through-hole spindle, driven by a powerful A.C. main motor, features stability and low noise during operation. Key parts like the NC system, turret, chuck and bearings on the ball screw and main spindle are products of highly respected international vendors. 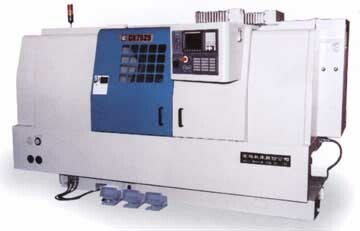 The CK7525 lathe is offered in four versions: CK7525, CK7525.500, CK7525C, CK7525C.750. The differences are in the maximal turning length (500 mm, 750 mm or 1 000 mm) and the maximal swing diameter (280 mm or 370 mm, measured over the carriage).